Hey guys! I thought I'd share mine and Brent's quick NYC trip! We were talking on Thursday (Dec 21st) about how we had a long weekend coming up and we should have planned a trip. So I tell him so very sarcastically, "I haven't been dying to go to New York or anything, don't worry about it". Then he's like, well, we should go, just drive up and have a long weekend! And that's exactly what we did! We left at 4:00 am since it's a 9 hour drive from where we live in southwest Virginia. I was SO excited that I wasn't even worried about being sleepy, so I started out driving and let Brent catch some extra zzz's. The drive wasn't bad AT ALL and I totally plan to do it again! We didn't even hit a single bit of traffic on the way to or from, which blew my mind since it was the weekend before Christmas. A lot of people asked about tolls, driving into the city, and where we parked the car. It was all simple, really. We paid maybe $40 in tolls the entire trip. Once we came into New York from the Lincoln Tunnel, it was about a 10 minute drive to the hotel. Brent did the driving in the city, but he made it look easy! It was like an extra $10 a day to add a parking package to our hotel stay so that's what we did. As soon as we arrived at the hotel, we pulled into the garage where an attendant parked the car, and that's where it stayed until we left on Sunday. 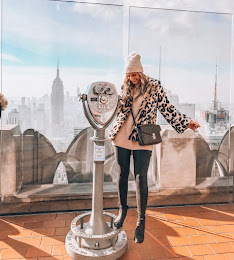 We stayed at The Manhattan at Times Square Hotel and it was in a perfect location! The room was pretty dated but I'm honestly not hard to please when it comes to hotels. As long as I have a bed with clean sheets and a working shower/sink, I'm fine. It was also one of the thinnest walled hotel rooms I've ever stayed in, we were right next to the elevator and ice machine, so I slept with my headphones in with white noise, haha. I love being in NYC so much that it would take a lot more than a noisy hotel room to get me down. We didn't really have a plan, we just wanted to see all the Christmas things! We mostly just walked everywhere because taxi's are crazy expensive. It also took us 3 tries to get the subway figured out and we took it to the Oculus at Ground Zero. We knew we wanted to see a broadway play, so on Saturday we went to stand in line at the TKTS booth in Times Square. Ya know, the giant red stairs that everyone sits on. (If you want to skip this story, we saw A Bronx Tale). So anyway, we're standing in line for just a few minutes and we look over and saw a girl that we went to high school with and now lives in NYC. It was the craziest thing!! Even though we were in the same city, where she now lives, it's still absolutely bizzare that we were in the same exact place at the same time to say hey! Then, she was able to let us skip the whole 45 minute long line and took us straight to the front. Score. We got tickets to see A Bronx Tale per her recommendation and it was AMAZING! Highly recommend!! We were on the go so much that we didn't plan our food stops out very well and definitely didn't take advantage of all our options, ugh. Magnolia Bakery - they have the most amazing banana pudding and cupcakes you'll ever eat. Prova Pizza in Grand Central Station - super good New York pizza! Bobby Flay's Bar Americain - I was surprisingly disappointed with this restaurant! My filet was way past seared, it was crispy burned on the outside (cooked correctly inside, at least). Brent wasn't impressed either. Very average food and definitely wasn't worth the money. Loco Coco - the coolest superfood smoothie bowl spot! McDonalds in Time's Square - Boring, I know. BUT, it's two stories and we got to watch the people in Times Square while we grabbed a quick breakfast! Better than your average McD, for sure. There's the TKTS big red stairs! Juniors for cheesecake - RED. VELVET. CHEESECAKE. OMG. My pictures are total tourist pictures. They're not the best I've ever taken, but pictures didn't do justice to one single building or view. However, I still look through them almost daily because I'm hopelessly in love with NYC and I'm already dying to go back. PLEASE leave me all of your recommendations for NYC so I can have things planned for my next trip! Our friend Hannah that we ran into! Slight payback for always photobombing my shots!